The folks at Cult Following are always a sucker for a grass roots success story – especially one involving a longtime film programmer going the route of film distributor to share one of those amazing WTF discoveries they’ve screened for a crowd of 40 to a bigger audience worldwide. It speaks to us as film lovers and programmers. A great example of this is longtime Exhumed Films programmer Harry Guerro, who has programmed some great events for the Alamo Drafthouse in New York (24 Hour Horrorthons and presentations of films like Starcrash, Jungle Holocaust and Troll 2). Guerro is now taking a couple of the films he’s discovered and loved and distributing them under the banner of Garagehouse Pictures. Check out some info on their first 2 releases, NINJA BUSTERS and TRAILER TRAUMA. 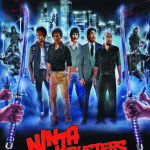 NINJA BUSTERS is a crazy 1984 kung fu comedy that looks like it’d pair up well with something like MIAMI CONNECTION for a night of martial arts madness and TRAILER TRAUMA is one of the freshest looking trailer compilations we’ve seen in a long while. Check out the press release for these 2 debut features and cover art after the jump! For nearly twenty years, film collector and Exhumed Films programmer Harry Guerro has helped introduce audiences to some of the rarest and weirdest cult movies in cinema history. Now, Guerro has created the specialty label Garagehouse Pictures to bring these forgotten films to viewers worldwide. Garagehouse Pictures will specialize in releasing previously unseen or obscure oddities on Blu-ray and DVD; the discs will be available exclusively through Diabolik DVD, the premier online source for horror and cult cinema from around the globe. In early January, Garagehouse will release its second disc, the movie preview compilation TRAILER TRAUMA. Unlike other collections which often recycled the same old previews for the same old genre titles, TRAILER TRAUMA features rare theatrical trailers that have not been previously released on DVD. 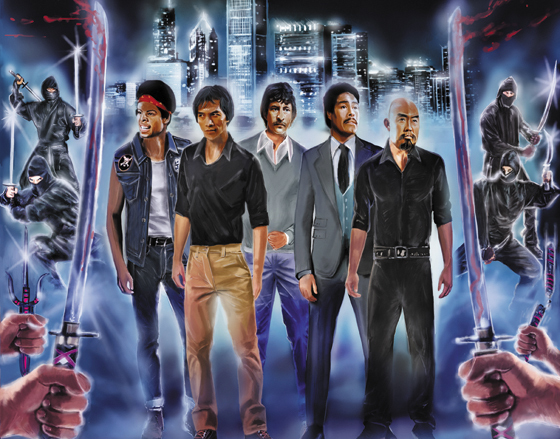 See over two hours of previously unavailable trailers for some of the most ridiculous films in history: thrill to the action of BLACK FIST, IRON MASTER, and KILL! KILL! KILL! KILL! Quiver in horror as you face the DAWN OF THE MUMMY, the REVENGE OF THE LIVING ZOMBIES, and the INCREDIBLE TORTURE SHOW! Scratch your head at the utter absurdity of DEATH BED, MUTANT WAR, and NO RETREAT, NO SURRENDER! For fans and connoisseurs of psychotronic cinema, TRAILER TRAUMA is an essential addition to any collection. Available for pre-order now from DiabolikDVD.com.